When these principles are written down into a single document or set of legal documents, those documents may be said to embody a written constitution; if they are written down in a single comprehensive document, it is said to embody a codified constitution. Some constitutions (such as the constitution of the United Kingdom) are uncodified, but written in numerous fundamental Acts of a legislature, court cases or treaties. Constitutions concern different levels of organizations, from sovereign countries to companies and unincorporated associations. A treaty which establishes an international organization is also its constitution, in that it would define how that organization is constituted. Within states, a constitution defines the principles upon which the state is based, the procedure in which laws are made and by whom. Some constitutions, especially codified constitutions, also act as limiters of state power, by establishing lines which a state's rulers cannot cross, such as fundamental rights. The Constitution of India is the longest written constitution of any country in the world, containing 444 articles in 22 parts, 12 schedules and 124 amendments, with 146,385 words in its English-language version. The Constitution of Monaco is the shortest written constitution, containing 10 chapters with 97 articles, and a total of 3,814 words. Generally, every modern written constitution confers specific powers to an organization or institutional entity, established upon the primary condition that it abide by the said constitution's limitations. According to Scott Gordon, a political organization is constitutional to the extent that it "contain[s] institutionalized mechanisms of power control for the protection of the interests and liberties of the citizenry, including those that may be in the minority". Activities of officials within an organization or polity that fall within the constitutional or statutory authority of those officials are termed "within power" (or, in Latin, intra vires); if they do not, they are termed "beyond power" (or, in Latin, ultra vires). For example, a students' union may be prohibited as an organization from engaging in activities not concerning students; if the union becomes involved in non-student activities, these activities are considered to be ultra vires of the union's charter, and nobody would be compelled by the charter to follow them. An example from the constitutional law of sovereign states would be a provincial parliament in a federal state trying to legislate in an area that the constitution allocates exclusively to the federal parliament, such as ratifying a treaty. Action that appears to be beyond power may be judicially reviewed and, if found to be beyond power, must cease. Legislation that is found to be beyond power will be "invalid" and of no force; this applies to primary legislation, requiring constitutional authorization, and secondary legislation, ordinarily requiring statutory authorization. In this context, "within power", intra vires, "authorized" and "valid" have the same meaning; as do "beyond power", ultra vires, "not authorized" and "invalid". In 621 BC, a scribe named Draco codified the cruel oral laws of the city-state of Athens; this code prescribed the death penalty for many offences (nowadays very severe rules are often called "Draconian"). In 594 BC, Solon, the ruler of Athens, created the new Solonian Constitution. It eased the burden of the workers, and determined that membership of the ruling class was to be based on wealth (plutocracy), rather than by birth (aristocracy). Cleisthenes again reformed the Athenian constitution and set it on a democratic footing in 508 BC. The Constitution of Medina (Arabic: صحیفة المدینه‎, Ṣaḥīfat al-Madīna), also known as the Charter of Medina, was drafted by the Islamic prophet Muhammad after his flight (hijra) to Yathrib where he became political leader. It constituted a formal agreement between Muhammad and all of the significant tribes and families of Yathrib (later known as Medina), including Muslims, Jews, and pagans. The document was drawn up with the explicit concern of bringing to an end the bitter intertribal fighting between the clans of the Aws (Aus) and Khazraj within Medina. To this effect it instituted a number of rights and responsibilities for the Muslim, Jewish, and pagan communities of Medina bringing them within the fold of one community – the Ummah. The precise dating of the Constitution of Medina remains debated but generally scholars agree it was written shortly after the Hijra (622). In Wales, the Cyfraith Hywel was codified by Hywel Dda ca. 942–950. The Nomocanon of Saint Sava (Serbian: Законоправило/Zakonopravilo) was the first Serbian constitution from 1219. This legal act was well developed. St. Sava's Nomocanon was the compilation of Civil law, based on Roman Law and Canon law, based on Ecumenical Councils and its basic purpose was to organize functioning of the young Serbian kingdom and the Serbian church. Saint Sava began the work on the Serbian Nomocanon in 1208 while being at Mount Athos, using The Nomocanon in Fourteen Titles, Synopsis of Stefan the Efesian, Nomocanon of John Scholasticus, Ecumenical Councils' documents, which he modified with the canonical commentaries of Aristinos and Joannes Zonaras, local church meetings, rules of the Holy Fathers, the law of Moses, translation of Prohiron and the Byzantine emperors' Novellae (most were taken from Justinian's Novellae). The Nomocanon was completely new compilation of civil and canonical regulations, taken from the Byzantine sources, but completed and reformed by St. Sava to function properly in Serbia. Beside decrees that organized the life of church, there are various norms regarding civil life, most of them were taken from Prohiron. Legal transplants of Roman-Byzantine law became the basis of the Serbian medieval law. The essence of Zakonopravilo was based on Corpus Iuris Civilis. In the Principality of Catalonia, the Catalan constitutions were promulgated by the Court from 1283 (or even two centuries before, if we consider the Usatges of Barcelona as part of the compilation of Constitutions) until 1716, when Philip V of Spain gave the Nueva Planta decrees, finishing with the historical laws of Catalonia. These Constitutions were usually made formally as a royal initiative, but required for its approval or repeal the favorable vote of the Catalan Courts, the medieval antecedent of the modern Parliaments. These laws had, as the other modern constitutions, preeminence over other laws, and they could not be contradicted by mere decrees or edicts of the king. On January 4, 1649 the Rump Parliament declared "that the people are, under God, the original of all just power; that the Commons of England, being chosen by and representing the people, have the supreme power in this nation". The Instrument of Government was adopted by Parliament on December 15, 1653 and Oliver Cromwell was installed as Lord Protector on the following day. The constitution set up a state council consisting of 21 members while executive authority was vested in the office of "Lord Protector of the Commonwealth"; this position was designated as a non-hereditary life appointment. It also required the calling of triennial Parliaments, with each sitting for at least five months. Constitution of May 3, 1791 (painting by Jan Matejko, 1891). Polish King Stanisław August (left, in regal ermine-trimmed cloak), enters St. John's Cathedral, where Sejm deputies will swear to uphold the new Constitution; in background, Warsaw's Royal Castle, where the Constitution has just been adopted. Corsican Constitutions of 1755 and 1794 were inspired by Jean-Jacques Rousseau. The latter introduced universal suffrage for property owners. The United States Constitution, ratified June 21, 1788, was influenced by the writings of Polybius, Locke, Montesquieu, and others. The document became a benchmark for republicanism and codified constitutions written thereafter. The Polish–Lithuanian Commonwealth Constitution was passed on May 3, 1791. Its draft was developed by the leading minds of the Enlightenment in Poland such as King Stanislaw August Poniatowski, Stanisław Staszic, Scipione Piattoli, Julian Ursyn Niemcewicz, Ignacy Potocki and Hugo Kołłątaj. It was adopted by the Great Sejm and is considered the first constitution of its kind in Europe and the world's second oldest one after the American Constitution. Another landmark document was the French Constitution, ratified on September 3, 1791. The first Swiss Federal Constitution was put in force in September 1848 (with official revisions in 1878, 1891, 1949, 1971, 1982 and 1999). The Serbian revolution initially led to a proclamation of a proto-constitution in 1811; the full-fledged Constitution of Serbia followed few decades later, in 1835. The first Serbian constitution (Sretenjski ustav) was adopted at the national assembly in Kragujevac on February 15, 1835. Political economy theory regards constitutions as coordination devices that help citizens to prevent rulers from abusing power. If the citizenry can coordinate a response to police government officials in the face of a constitutional fault, then the government have the incentives to honor the rights that the constitution guarantees. An alternative view considers that constitutions are not enforced by the citizens at-large, but rather by the administrative powers of the state. Because rulers cannot themselves implement their policies, they need to rely on a set of organizations (armies, courts, police agencies, tax collectors) to implement it. In this position, they can directly sanction the government by refusing to cooperate, disabling the authority of the rulers. Therefore, constitutions could be characterized by a self-enforcing equilibria between the rulers and powerful administrators. As of 2017[update] only two sovereign states, New Zealand and the United Kingdom, have wholly uncodified constitutions. The Basic Laws of Israel have since 1950 been intended to be the basis for a constitution, but as of 2017 it had not been drafted. The various Laws are considered to have precedence over other laws, and give the procedure by which they can be amended, typically by a simple majority of members of the Knesset (parliament). Uncodified constitutions are the product of an "evolution" of laws and conventions over centuries (such as in the Westminster System that developed in Britain). By contrast to codified constitutions, uncodified constitutions include both written sources – e.g. constitutional statutes enacted by the Parliament – and unwritten sources – constitutional conventions, observation of precedents, royal prerogatives, customs and traditions, such as holding general elections on Thursdays; together these constitute British constitutional law. Some constitutions are largely, but not wholly, codified. For example, in the Constitution of Australia, most of its fundamental political principles and regulations concerning the relationship between branches of government, and concerning the government and the individual are codified in a single document, the Constitution of the Commonwealth of Australia. However, the presence of statutes with constitutional significance, namely the Statute of Westminster, as adopted by the Commonwealth in the Statute of Westminster Adoption Act 1942, and the Australia Act 1986 means that Australia's constitution is not contained in a single constitutional document. It means the Constitution of Australia is uncodified, it also contains constitutional conventions, thus is partially unwritten. The terms written constitution and codified constitution are often used interchangeably, as are unwritten constitution and uncodified constitution, although this usage is technically inaccurate. 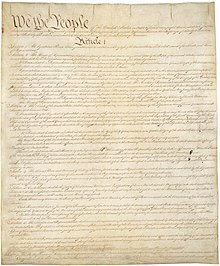 A codified constitution is a single document; states that do not have such a document have uncodified, but not entirely unwritten, constitutions, since much of an uncodified constitution is usually written in laws such as the Basic Laws of Israel and the Parliament Acts of the United Kingdom. Uncodified constitutions largely lack protection against amendment by the government of the time. For example, the UK Fixed-term Parliaments Act 2011 legislated by simple majority for strictly fixed-term parliaments; until then the ruling party could call a general election at any convenient time up to the maximum term of five years. This change would require a constitutional amendment in most nations. The strongest level of entrenchment exists in those constitutions that state that some of their most fundamental principles are absolute, i.e. certain articles may not be amended under any circumstances. An amendment of a constitution that is made consistently with that constitution, except that it violates the absolute non-modifiability, can be called an unconstitutional constitutional law. Ultimately it is always possible for a constitution to be overthrown by internal or external force, for example, a revolution (perhaps claiming to be justified by the right to revolution) or invasion. In the Constitution of India, the Supreme Court has created the Doctrine of Basic Structure in Kesavananda Bharti's case (1973) stating that the essential features of the Basic structure cannot be amended by the Parliament. The Court has identified judicial review, independence of Judiciary, free and fair election, core of Fundamental Rights as a few of the essential features which are unamendable. However, the Supreme Court did not identify specific provisions which are in the category of absolute entrenchment. A critical analysis of the Doctrine of Basic Structure appears in Professor M.K. Bhandari's book Basic Structure of Indian Constitution – A Critical Reconsideration. In parliamentary systems, Cabinet Ministers are accountable to Parliament, but it is the prime minister who appoints and dismisses them. In the case of the United Kingdom and other countries with a monarchy, it is the monarch who appoints and dismisses ministers, on the advice of the prime minister. In turn the prime minister will resign if the government loses the confidence of the parliament (or a part of it). Confidence can be lost if the government loses a vote of no confidence or, depending on the country, loses a particularly important vote in parliament, such as vote on the budget. When a government loses confidence, it stays in office until a new government is formed; something which normally but not necessarily required the holding of a general election. Many constitutions allow the declaration under exceptional circumstances of some form of state of emergency during which some rights and guarantees are suspended. This provision can be and has been abused to allow a government to suppress dissent without regard for human rights – see the article on state of emergency. Italian political theorist Giovanni Sartori noted the existence of national constitutions which are a facade for authoritarian sources of power. While such documents may express respect for human rights or establish an independent judiciary, they may be ignored when the government feels threatened, or never put into practice. An extreme example was the Constitution of the Soviet Union that on paper supported freedom of assembly and freedom of speech; however, citizens who transgressed unwritten limits were summarily imprisoned. The example demonstrates that the protections and benefits of a constitution are ultimately provided not through its written terms but through deference by government and society to its principles. A constitution may change from being real to a facade and back again as democratic and autocratic governments succeed each other. ^ The New Oxford American Dictionary, Second Edn., Erin McKean (editor), 2051 pp., 2005, Oxford University Press, ISBN 0-19-517077-6. ^ Pylee, M.V. (1997). India's Constitution. S. Chand & Co. p. 3. ISBN 978-81-219-0403-2. ^ Sarkar, Siuli (2009). Public Administration In India. PHI Learning Pvt. Ltd. p. 363. ISBN 978-81-203-3979-8. ^ Kashyap, Subhash (1994). Our Constitution – An introduction to India's Constitution and Constitution Law. National Book Trust, India. p. 3. ISBN 978-81-237-0734-1. ^ Nivedita, V. "The 124th Amendment: A look at the facts". @businessline. Retrieved 2019-04-18. ^ a b "Constitution Rankings". Comparative Constitutions Project. Retrieved 2016-06-05. ^ "Constitution of India". Ministry of Law and Justice of India. July 2008. Archived from the original on February 23, 2015. Retrieved December 17, 2008. ^ "Constitute". www.constituteproject.org. Retrieved 2016-06-05. ^ Gordon, Scott (1999). Controlling the State: Constitutionalism from Ancient Athens to Today. Harvard University Press. p. 4. ISBN 978-0-674-16987-6. ^ R.B. Serjeant, The Sunnah Jami'ah, pacts with the Yathrib Jews, and the Tahrim of Yathrib: Analysis and translation of the documents comprised in the so-called "Constitution of Medina." Bulletin of the School of Oriental and African Studies, University of London, Vol. 41, No. 1. (1978), p. 4. ^ Watt. Muhammad at Medina. pp. 227–228 Watt argues that the initial agreement was shortly after the hijra and the document was amended at a later date specifically after the battle of Badr (AH [anno hijra] 2, = AD 624). Serjeant argues that the constitution is in fact 8 different treaties which can be dated according to events as they transpired in Medina with the first treaty being written shortly after Muhammad's arrival. R. B. Serjeant. "The Sunnah Jâmi'ah, Pacts with the Yathrib Jews, and the Tahrîm of Yathrib: Analysis and Translation of the Documents Comprised in the so called 'Constitution of Medina'." in The Life of Muhammad: The Formation of the Classical Islamic World: Volume iv. Ed. Uri Rubin. Brookfield: Ashgate, 1998, p. 151 and see same article in BSOAS 41 (1978): 18 ff. See also Caetani. Annali dell'Islam, Volume I. Milano: Hoepli, 1905, p. 393. Julius Wellhausen. Skizzen und Vorabeiten, IV, Berlin: Reimer, 1889, pp. 82ff who argue that the document is a single treaty agreed upon shortly after the hijra. Wellhausen argues that it belongs to the first year of Muhammad's residence in Medina, before the battle of Badr in 2/624. Wellhausen bases this judgement on three considerations; first Muhammad is very diffident about his own position, he accepts the Pagan tribes within the Umma, and maintains the Jewish clans as clients of the Ansars see Wellhausen, Excursus, p. 158. Even Moshe Gil a skeptic of Islamic history argues that it was written within 5 months of Muhammad's arrival in Medina. Moshe Gil. "The Constitution of Medina: A Reconsideration." Israel Oriental Studies 4 (1974): p. 45. ^ The Late Medieval Balkans: A Critical Survey from the Late Twelfth Century John Van Antwerp Fine . Google Books. Retrieved July 12, 2013. ^ Metasearch Search Engine. Search.com. Retrieved July 12, 2013. ^ Dusanov Zakonik Archived August 3, 2010, at the Wayback Machine. Dusanov Zakonik. Retrieved July 12, 2013. ^ Mangoné Naing, SAH/D(2006)563 The Kurukan Fuga Charter: An example of an Endogenous Governance Mechanism for Conflict Prevention, Inter-generational Forum on Endogenous Governance in West Africa organised by Sahel and West Africa Club / OECD, Ouagadougou (Burkina Faso), June 26 to 28, 2006. pp. 71–82. ^ "The United States has "the longest surviving constitution."". PolitiFact.com. Retrieved November 10, 2013. ^ a b Tooker E (1990). "The United States Constitution and the Iroquois League". In Clifton JA. The Invented Indian: cultural fictions and government policies. New Brunswick, NJ: Transaction Publishers. pp. 107–128. ISBN 978-1-56000-745-6. ^ Grinde, D (1992). "Iroquois political theory and the roots of American democracy". In Lyons O. Exiled in the land of the free: democracy, Indian nations, and the U.S. Constitution. Santa Fe, NM: Clear Light Publishers. ISBN 978-0-940666-15-3. ^ Armstrong, VI (1971). I Have Spoken: American History Through the Voices of the Indians. Swallow Press. p. 14. ISBN 978-0-8040-0530-2. ^ "H. Con. Res. 331, October 21, 1988" (PDF). United States Senate. Retrieved November 23, 2008. ^ Shannon, TJ (2000). Indians and Colonists at the Crossroads of Empire: The Albany Congress of 1754. Ithaca: Cornell University Press. pp. 6–8. ISBN 978-0-8014-8818-4. ^ Rakove, J (November 7, 2005). "Did the Founding Fathers Really Get Many of Their Ideas of Liberty from the Iroquois?". George Mason University. Retrieved January 5, 2011. ^ Jennings F (1988). Empire of fortune: crown, colonies, and tribes in the Seven Years War in America. New York: Norton. pp. 259n15. ISBN 978-0-393-30640-8. ^ Snow DR (1996). The Iroquois (The Peoples of America Series). Cambridge, MA: Blackwell Publishers. pp. 154. ISBN 978-1-55786-938-8. ^ Instrument of Government (England ) . Encyclopædia Britannica. Retrieved July 12, 2013. ^ Francis D. Wormuth (1949). The Origins of Modern Constitutionalism. Harper & Brothers. ^ Lee, Sidney (1903), Dictionary of National Biography Index and Epitome p. 991. ^ constitution (politics and law). Encyclopædia Britannica. Retrieved July 12, 2013. ^ Blaustein, Albert (January 1993). Constitutions of the World. Fred B. Rothman & Company. ISBN 978-0-8377-0362-6. ^ Isaac Kramnick, Introduction, Madison, James (1987). The Federalist Papers. Penguin Classics. ISBN 978-0-14-044495-7. ^ "The Polish Constitution of May 3rd – a milestone in the history of law and the rise of democracy". Retrieved 2018-09-14. ^ "The Constitution of May 3 (1791)" (PDF). Retrieved 2018-09-14. ^ Relectiones, Franciscus de Victoria (lect. 1532, first pub. 1557). ^ Weingast, Barry R. (Summer 2005). "The Constitutional Dilemma of Economic Liberty". Journal of Economic Perspectives. 19 (3): 89–108. doi:10.1257/089533005774357815. ^ González de Lara, Yadira; Greif, Avner; Jha, Saumitra (May 2008). "The Administrative Foundations of Self-Enforcing Constitutions". The American Economic Review. 98 (2): 105–109. CiteSeerX 10.1.1.386.3870. doi:10.1257/aer.98.2.105. ^ "Basic Laws – Introduction". The Knesset. 2016. Retrieved 7 May 2017. Article gives information on the procedures for amending each of the Basic Laws of Israel. ^ "Republic of Honduras: Political Constitution of 1982 through 2005 reforms; Article 374". Political Database of the Americas (in Spanish).